Living in Denver, or rather Colorado as a whole, there are mainly two topics of contention and discussion around this season. It doesn’t matter where you may be or what you may be doing, chances are one of these two topics will somehow make their way into the conversation before its end. The discussion of one is the passionate sort; it brings excitement, misery and loyalty like nothing can. The other is filled with much the same except add frustration, often disdain, and in my case, awe. Last Sunday pretty much brought one of those topics to a disappointing halt. The Denver Broncos’ season came to a surprising (not really) and very disappointing end. We were hoping to make it the Championship game with another chance at the Super Bowl. My husband and I both knew it was a long shot. They haven’t played well in a few weeks but the loyal fans we are, there is always that glimmer of hope and faith in your team. It was a disappointing Sunday and quite the bleak Monday. I am usually not the kind of person who mopes around in a bad mood that my team lost but even I felt really quite blah Monday morning. Oh well…we’ll get over the disappointment. We always do. I made cake with lots of raspberry jam on Monday. We’ll be fine. So, what’s the other topic? Weather. Colorado weather is absolutely fascinating. It is to me, at least. I find myself enjoying every season that graces us here in The Rockies. I can look out of my windows, be it at home or driving, and get lost in the deep, deep blue skies, the voluminous puffs of clouds or the mysterious mists that appear on the horizons. The Rocky Mountains allow us to experience the most unpredictable weather systems. Take for example, last Monday, we had a 61 degree drop! The last ten days or so, we’ve had nothing but gloom. The weather forecast mentions nothing about snow and yet we’ll have snow flakes almost every day for days. One rare day, last week, the snow and gloom cleared up and we had a glimpse of a beautifully, sunny spring day. One of the most soul lifting days are the ones that follow a snow storm. On these days, the sky is the deepest blue with not even a wisp of a cloud loitering nearby. There is something pure and clean about a day like that. The snow melts away the misery, the failed dreams and hopelessness of the days. As they wash away, streaming through the neighbourhoods, nooks and crannies, a new day emerges, bright and full of new dreams and desires. I love my snowy days but I look forward to the beauty and brightness of the day after. Cold and snowy days are also the days I love to fire up the grill. Who says you only have to grill in the summer? My gas grill is outside on my porch and when I feel like taking it easy, I fire it up and grill meat. This was one of those days. The weather back then was still quite nice, cold but pleasant. I always find the heat emanating from the grill more tolerable in the colder weather, a fire with a double purpose. These Korean Tacos are easy. Marinate some steak for a bit in soy sauce and brown sugar, gather up the condiments and any toppings you want on the tacos, crank up the grill, cook the meat, toast the tortillas, slice the meat and assemble. 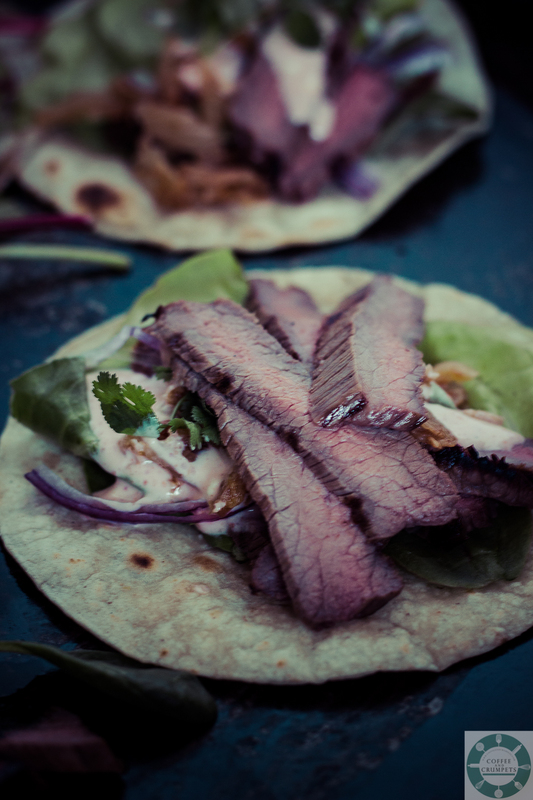 My tacos were fairly simple, corn tortillas gently toasted on the grill, sliced beef, slivers of cucumber, red onions, baby kale, baby spinach, soft butter lettuce, extra garlicky kimchi and drizzled with Sriracha sour cream. They were fabulous. No hard and fast rule here, use the tortillas you like with the meat you prefer and the toppings you want. Make them your own. 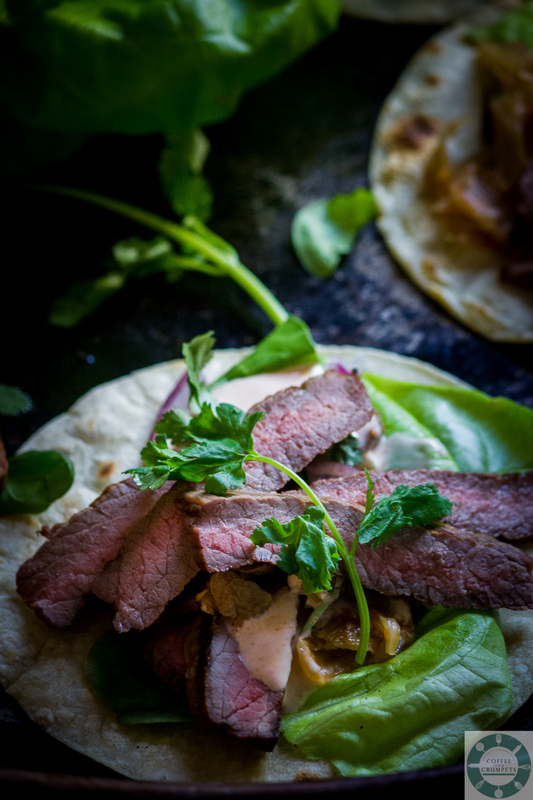 Grilled steak tacos with an Asian flavour. Mix the soy sauce, water, sugar and sesame oil together in a bowl. Add the beef steak and leave to marinade for an hour. Meanwhile, gather the toppings and condiments. Julienne the cucumbers and carrots. Mix as much Sriracha as you'd like into sour cream. Remove the meat from the marinade and shake off as much of the marinade as you can. Allow the flames to kiss the meat a little to get some charred bits. Cook the meat as desired. I cooked mine about 6-8 minutes on one side and about 3-4 minutes on the other. My steak was not very thick so it cooked perfectly medium. Let the meat rest about 10 minutes before slicing. While the meat is resting, heat up the tortillas on the grill and keep warm in a towel or some foil. Assemble the tacos as desired and enjoy! I love tacos. They are so many variations and each persons taco is unique. Having said that, I wonder why I don’t make them more often? I guess there’s so many different foods to try and just not enough time! Right now I am not a big fan of the freezing cold temperatures and the snow…so much snow….but the sun when it shines brightens up the horizon like nothing else does. The tacos look like a work of art. Beautiful!! minnie@thelady8home recently posted..Are you getting enough Vitamin D? I love love loveeee Tacos! I haven’t been able to find any decent taco joints since moving to the Midwest from California ( I guess you can say I’m spoiled, lol). I’ve been getting by by making semi-good homemade tacos. I love the flavors of these! Henna recently posted..Feature on Ainy Cooks! Oh my! Those tacos sound so good. Lovely clicks Nazneen. This solves all of our problems when we have a Korean BBQ at home. The boys can never get filled up on beef, veggies and pickles alone so some extra carbs from the tortillas is a great idea. Loving your food plating and composition. Beautiful! I actually just printed out this recipe…along with a few others like your beautifully bright Chicken Kebabs with Lemon Rice. Yum! Can’t wait to try these. Those beef slices are so tender, juicy and perfectly cooked! I love the flavours, Nazneen, and the presentation is flawless! 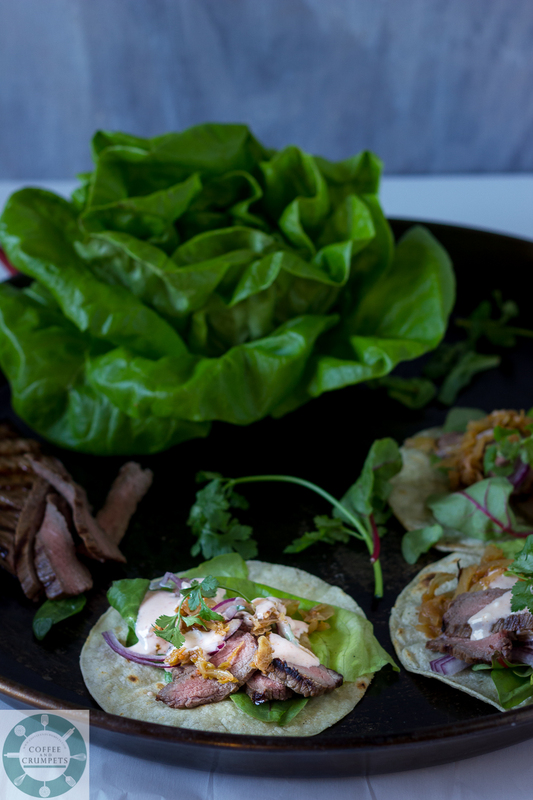 Kimchi on Beef tacos, what a great idea!!!! btw, i dare you to try eating this tacos with raw garlic, just like what korean people did when they eat any grilled meat…. Love tacos! There is a place here that specialises in Korean tacos…have been planning to go for over a year now…never got around to! But now I have your lovely recipe to make them at home. It’s perfect for our season. And all that green is so gorgeous! This year summer temperatures have been unbearable. I wish I could swap when I wanted.. Have a great weekend! I am such a sports snob, that’s only because I understand very little:(. I hear your passion though. I did hear my little one scream when they lost…. Stay warm girlfriend. Kimchi sounds yum, and these tacos are gorgeous. Your pictures are fab. P.
We have had our share of gloomy weather too – but no snow! And after last years “snowmegedon” (when our city shut down and left so many folks stranded on highways for 8+ hours) – that might be a good thing! Love simple eats – I’ve never tried kimchi on a taco before – thanks for sharing and hope you keep warm Nazneen! Weather is rarely something we discuss in Tucson but, when we do, it is about rain. How we LOVE the rain, especially a good monsoon season. Because it is so hot here, most people consider grilling season to be the winter! (And, of course, spring and summer.) We, however, grill year round and love it. 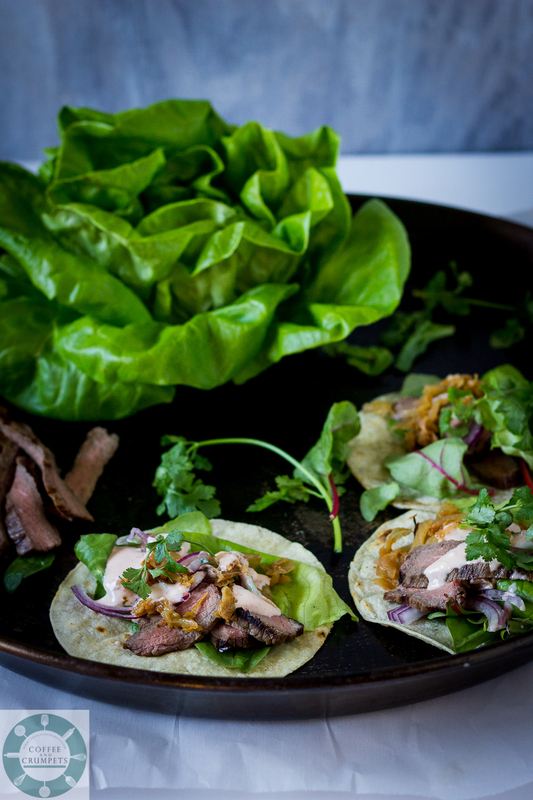 And I want to make these tacos (minus the kimchi, of course) soon for dinner. We will love them! Did you use sirloin or flank for these? The grain looks like flank but I can’t tell for sure! Your slices look truly perfect! And after freezing drizzle and snow, I think it’s supposed to be very warm today. 😉 oh and those Broncos. I wasn’t as devastated as last year simply because we hadn’t been playing strong for the last few weeks. In my mind we had a 50/50 chance to win on Sunday. But still disappointed. Strong move on Elway’s part to part ways with Fox. Ok, I’ve talked about the two Colorado subjects, so now I’ll switch to these beautiful tacos. I must make them soon. I’m not a kimchee fan, but I’ve only tasted it on it’s own. As a player in a taco, I will try it again. Thanks for a great recipe. Pinned. Wow… The photos are breathtaking! Everything looks so freshlicious…. I could eat several all by myself. You are quite courageous to fire up your grill in Colorado super cold weather. Take care, Nazneen! Nazneen, I was sad Sunday night too, although I am not a fan of this sport but hay I’m in Colorado so I should cheer for the Broncos… I live so close to their fan club, and I kept wondering poor fans, they must have been so sad. I hope they will do better next time. Loved your tacos and I was thinking the same lately when making this week’s menu plan… why we do not have more tacos!!!?? It is one of the easiest dinners one can make. Thanks for the new variation 🙂 I will try this for sure. Who doesn’t like tacos? And Korean ones are fun — there’s a restaurant that specializes in them about a 30 minute walk from my house. Anyway, terrific recipe. Thanks. Sorry about the Broncos, but there’s always next year! These tacos look wonderful Nazneen. Love these flavors. Also, is that a Victoria Sponge in that photo? I would love a big slice with loads of whipped cream and a hot cup of coffee. Thanks Karen! They were delicious! And yes, that is a Victoria Sponge 🙂 One of my childhood favourites and an absolute comfort cake for me. Drowning my Broncos sorrows. stay warm friend. im not a winter person so i am ready for some wam weather. i love the flexibility of these tacos, nom nom nom. I love grilling anytime, too! 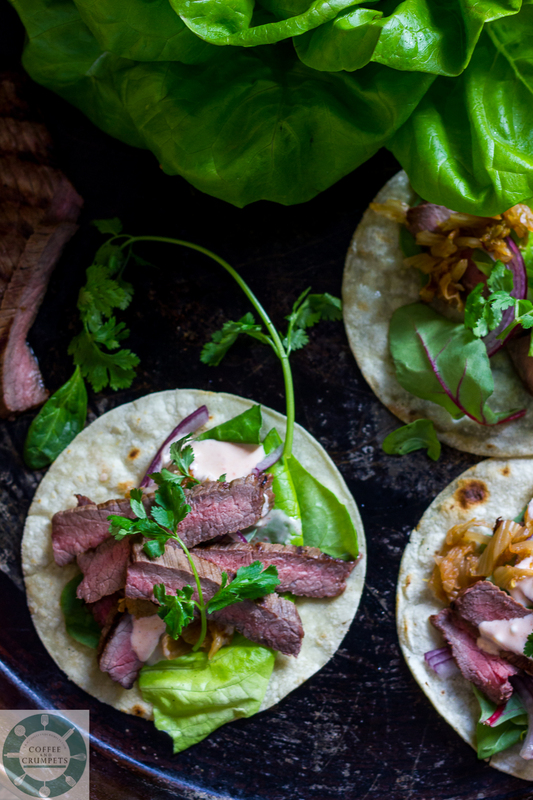 These Korean tacos are great with the grilled beef! Tasteh!!! Thanks Julie and Alesah! I prefer grilling in winter to summer! It gets so hot in front of fire in the summer! 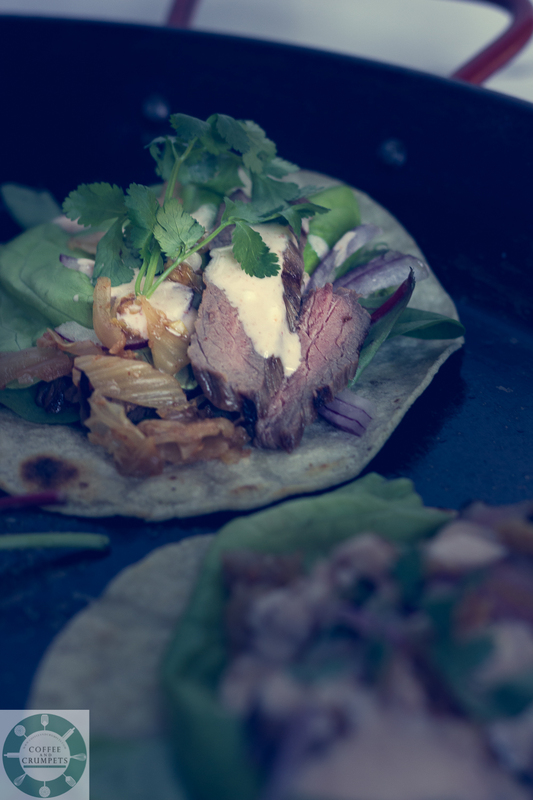 I love tacos too – and every time I do them I wonder why so long between outings? I like when you can put a load of toppings and condiments on the table and everyone builds their own dinner. I should do this for our next mahjong night instead of trying to be fancy – it’s much more fun and sociable eating like this.